By the time a Canadian graduates from high school, there is one Canadian poem he or she is likely to know: “In Flanders Fields.” We might mistake McCrae’s poem for the central text of Canadian literature, so unfailingly can our students intone it. If one aim of mandatory schooling is to guarantee basic knowledge of one’s country, the Canadian literary education cannot claim success.1 Insufficient resources are compounded by conspicuous indifference and confusion about which authors are essential. Whose place in the Canadian canon is firm enough for teaching? Who can challenge McCrae? How a students’ campaign on an isolated reserve overcame years of official neglect. Setting out to map not the ideal, but the de facto Canadian canon, by examining the basic texts of a Canadian’s education—and by talking to the instructors who teach them, or do not—we find our curricula strangely untouched by the 1960s and ’70s, decades that saw the sustained efforts of writers, critics, publishers and legislators to reverse-engineer a canon, aggrandize our literature and instil it in our schools. The abiding paucity of Canadian authors in the classroom belies a nation-building project that failed to endure. Canada has missed its national moment. Canadian cultural nationalism first took legislative shape following the 1951 report of the Royal Commission on National Development in the Arts, Letters and Sciences, aka the Massey Report. We can even detect the origins of Canadian canonic anxiety in the report: “Is it true, then, that we are a people without a literature?” A few years earlier, reviewing The Book of Canadian Poetry, Northrop Frye diagnosed this anxiety as “the colonial position of Canada … a frostbite at the roots of the Canadian imagination.” The Massey Report’s recommendations were intended to defrost Canadian creativity through financial empowerment, with a view to fortifying against every “twitch and grunt” of Trudeau’s famous sleeping elephant, America. The Writers’ Trust of Canada, founded as the Writers’ Development Trust in 1976, commissioned one of the more peculiar artifacts of the nationalist era. Intending to bridge the gap between students and the canon, the trust developed “resource guides for the teaching of Canadian literature.” The guides’ composition was national and representational: “five work groups were assembled to provide nation-wide talent and representation, and topics were similarly chosen to reflect national interests.” With audacious critical assurance, the authors claimed the chosen books were “with no exceptions, of proven literary merit.” The ten-volume set cost $15. No new editions were developed. Students of teachers still heeding advice to use “the songs of Anne Murray, Gene MacLellan, [and] John Allan Cameron” can only be considered a lost generation. It was not until 2002 that the Canada Council decided to reinvestigate the state of Canadian literature in high schools, wondering, “might it be time to produce another series of guides?” It commissioned the Writers’ Trust to write a report. 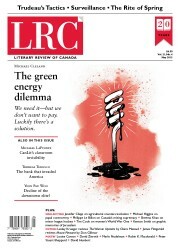 That report, “English-Language Canadian Literature in High Schools,” concluded that although “there have been profound changes in the educational environment since the 1970s,” the “challenges remain very much the same as 30 years ago.” Few students could identify ten Canadian writers, and most read no more than five Canadian books during their secondary education. Only 31 percent of schools offered a Canadian literature course, mostly as an elective, and the report predicted that that number “will continue to decline.” Some teachers make room for Canadians in the independent study units, although a retired teacher from an independent Anglican school in Port Hope, Ontario, commented, “I don’t believe that books are really on the curriculum unless everyone reads them.” Why did our zealous, if sometimes foppish, nationalism fail to sustain? The Writers’ Trust report details some basic, tangible impediments. Lack of resources remains the most pressing. As a grade 11/12 teacher in Vancouver said, “if Canadian publishers want Canadian schools to teach Canadian authors, they could offer us class sets at a deeper discount.” Over the past two decades, however, this has become less and less feasible. Canadian publishers lean heavily on heritage and cultural programs, which between 1994 and 1998 alone were cut by 23.3 percent. Following the hostile takeover of Chapters by Indigo Books and Music Inc. in 2000, and the subsequent collapse of Stoddart’s General Distribution Services in 2002, more than 60 Canadian publishers relied on the emaciated Department of Canadian Heritage for a bailout. Taking a cue from Jean Chrétien, Harper’s Conservatives cut that department’s budget by a further 5.6 percent in 2011. Certain intangible variables continue to thwart the teaching of Canadian literature. One is what the report calls the “new definition of ‘text’,” a theory that trickled down from the revisionist frenzy of the academy. A 1997 study of the Alberta secondary school literary canon noted the post-national attitudes of anthology editors, combined with what Brenda Reed, in her study of Ontario secondary school curricula, calls “the increasing move away from text-based interpretations of literature to reader response and post-modern theories.” Interestingly, this expanded, post-national definition of literary legitimization did not derive from Canadian criticism. It is itself, like our dog-eared copies of To Kill a Mockingbird, an imported product. Several remedies to CanLit’s terminal dullness have been offered. Some suggest regionalism, which satisfies the instinct to decentralize the canon, while yet instilling a sense of citizenship. Jean Baird, for example, advocates for something akin to a literary locavore diet, right down to the neighbourhood. Students in Vancouver’s Chinatown should be exposed to Wayson Choy and Sky Lee, while East Vancouver schools should incorporate Wayde Compton and Evelyn Lau. If a central anxiety of Canadian identity is our sense of vastness and disconnection, however, regionalism runs the risk of further isolating students, reinforcing the sense that we are little more than a loosely aligned cultural archipelago. It is appealing to teach students more about themselves, specifically in urban, multicultural areas. In the Toronto District School Board, for example, where seven out of ten students are not white, two thirds of surveyed students said learning about their own race would make school more interesting and almost half believed it would improve their grades. But we would probably not advocate for a locavore diet in areas of cultural homogeneity, where the notion of “learning about your own race” has a more sinister aspect. Surely a key function of literature is to place the reader in a dialectic relationship with another human experience. A curriculum drawn from a 100-mile radius will not always be positioned to achieve this. Very few teachers observe anything like nationalism in today’s students. A grade 10/11/12 teacher at an independent school in Toronto told me that students “are unaware, most of the time, that a book was written by a Canadian. I introduce the fact but it slides away as irrelevant at some point in the teaching.” “I don’t make a big deal about the authors’ nationalities,” said the teacher in Vancouver, and “I don’t think students question the nationality of a story’s author.” Either the Trudeau generation failed to pass the torch, or someone failed to grasp it. Are we content with this? Should we embrace the post-nationalism of the 21st century, or revive some fraught sense of literary protectionism? A cosmopolitan pedagogy is attractive to the liberal imagination, but cosmopolitan so often means, simply, American, and it would not be thoughtful to extend post-nationalism beyond the cultural sphere, into, say, the treatment of our natural resources. We do not want to ghettoize or tokenize Canadian literature, or teach a book for its author’s origin rather than its aesthetic strength, but left alone, we do not seem to cherish that strength where indeed it can be found. “Speaking as someone who has taught at the high school level all the plays of Shakespeare, three of Austen’s novels and several works by Twain,” that teacher in Port Hope said, “I believe that Canada’s best authors hold their own.” This is a judgement every Canadian shares, on November 11. Michael LaPointe is a writer and literary journalist in Vancouver. He contributes to the Times Literary Supplement. It is an unnerving reflection on Michael LaPointe’s most interesting essay on the difficulties of teaching Canadian literature in schools that if Canadian novels were omitted entirely from such teaching (classical foreign novels could be used instead: Hemingway et al.) and the Canadian curriculum limited to poems and short stories, the difficulties he outlines would vanish entirely.